The must see concert of the summer will be the Red Hot Chili Peppers. They play April 10 at the Sidney Myer Music Bowl, which is definitely Melbourne’s best concert venue (weather permitting). Tickets go on sale tomorrow morning (Friday September 1) at 9AM. My guess is that tickets won’t last more than a couple of hours. What: Original Glazed for $13 a dozen with $5 per dozen donated to Melbourne Citymission’s Homelessness Campaign. This is a fundraiser to help Melbourne Citymission and will have appearances by AFL and Melbourne Victory players. I guess Brunetti’s won’t be getting much business tommorow. It is safe to guess that the state election is heading our way. I received in my mailbox a letter from my local state MP, stating all the things he had achieved in the past few years. Attached to said letter was a sample voting form, telling me how to elect his party into government. We are not finished with August yet and November is still a very long time away. But the campaigning has already began. Maybe I should give him a call, and tell him to send me his resume and I might schedule an interview should I decide to employ him as my MP. – The Dalai Lama during his 96′ visit to Oz. It’s been announced that the Dalai Lama will be headin’ over our way in June of next year. On the “Geelong Australia” website (“http://www.geelongaustralia.com.au/Media_Releases/June_2006/His_Holiness_the_Dalai_Lama_to_return_to_Geelong_next_year/”) it says that he will return to Geelong on the 11th of June next year to bless a new Buddhist centre. Apparently, his last visit brought 15,000 people, and his next is expected to pull about 20,000. This will be his fifth visit to both Australia and New Zealand. I found out about this earlier in the month and it’s been par boiling since. Tonight a girlfriend showed me pics of her little cuz, do you remember those great kinda, primary – arrgghh highschool pics you had once a year – and it all came back. Guessed what prized possessions i got my worthless hands on this week? 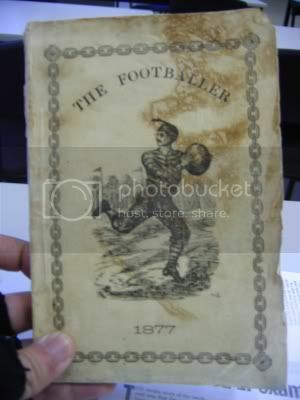 A book that’s over 2 centuries old, on Australian Football. As a non-footy fan, i couldnt give a hoot about this book. I would, however, keep the book for posterity’s sakes as it fetches a high price. Now wouldn’t you, a footy fan, covert the book? Following up on Zara’s post, tomorrow is Melbourne Day. Wednesday 30 August, 2006, represents a milestone in Melbourne’s history, marking 171 years since the city’s founding – the day the first European settlers landed on the north bank of the Yarra River from the schooner Enterprize in 1835. There are all the usual events for the day but what struck me are the deals they are offering at certain Melbourne venues. Just a reminder that this sunday is Father’s day. Myer has a small gift guide on its website which has a few good ideas. The Monty Python DVD Box set is a decent gift at $37 and you can’t go wrong with a tie. Does anyone else have some suggestions or plans? Hand-held hoses fitted with a trigger nozzle permitted to water gardens, lawns and rinsing purposes. Buckets, watering cans, high pressure cleaning devices or commercial car wash services can still be used to wash vehicles. Alternate days? This means that odd-numbered houses can water on odd days while even-numbered houses can water on even days. So if you live in an odd-number house, you get to water for one extra day more than your even-numbered neighbours. Reminded me of the days in Paris when even-numbered registered vehicle are permitted on the roads on even days and vice-versa, all because of air pollution. You’ve talked about with friends and on your tram ride in or out of town you keep reminding yourself I’ve got to go see that. It’s pretty hard to find the time when you work for the man, and weekends are horrendeous. If you didn’t know, NGV International’s latest blockbuster Melbourne Winter Masterpiece is Picasso: Love & War 1935-1945. From the Musee Picasso in Paris, 300 works explore Pablo’s relationship both artistic and personal with his lover and muse, Dora Maar. One of those amazingly inspirational and creative pairings that commenced before the Spanish Civil War and outlasted WW2.